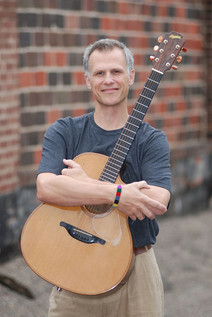 Peter Mayer’s songs are fresh and unique, earthy and intimate. His welcoming voice and inventive guitar work provide the perfect vehicle for his down-home wisdom and a sweep of themes that includes Buddha, Jesus, Columbus, Isaac Newton and…Harley Davidson. Peter began playing the guitar and writing songs when he was in high school. He studied theology and music in college, then spent two years in seminary. After deciding that the priesthood wasn’t for him, he took a part-time job as a church music director for 8 years, while performing at clubs and colleges and writing and recording his music. In 1995 he quit his job and started touring full-time. Since then, Peter has gradually gained a dedicated, word-of-mouth following, selling out shows from Minnesota to Texas, New England to California. He has 9 CDs to his credit and has sold over 50,000 of them independently. Peter’s annual visits to Green Wood attract large audiences, often selling out. Get your tickets early!